Tickets on the day of show (if any remain) will be $17 and only available at Miner Brewing Company. 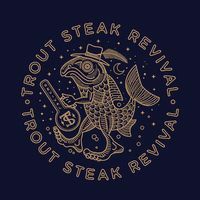 Get your tickets early to see Trout Steak Revival at Miner Brewing Company on Wednesday, June 13. Ever since winning the 2014 Telluride Bluegrass Festival Band Competition, Trout Steak Revival has quickly become a quintessential Colorado band. The band won an Emmy Award for a soundtrack they contributed to a Rocky Mountain PBS. They collaborate with school children in mentoring programs in Denver and Steamboat Springs. Their music is featured on Bank of Colorado’s radio and television advertisements. Most recently, Westword named them Denver’s Best Bluegrass Band, and they were nominated as a Momentum Band of the Year by the International Bluegrass Music Association. Don’t miss your chance to see them live at Miner Brewing Company on Wednesday, June 13. This highly anticipated, after-hours show in the Tap Room begins at 8:30 p.m. Advance tickets are just $15 and are expected to go fast. Tickets are now available in the Miner Brewing Company Tap Room, by calling 605.574.9635, or ordering online at PrairieBerry.com. Any remaining tickets will be sold on the day of the show for $17.